When I was in Kazakhstan way back in May there were several species of lizard we spotted that I have neglected to write about for 10,000 Birds, which is a shame because they are pretty cool lizards, as most lizards tend to be. Three of the four were spotted near one of the two waterholes we visited in the arid eastern part of the country and the other was spotted at the Korgalzhyn State Nature Reserve. The first lizard featured here is the Steppe Agama Trapelus sanguinolentus. We came across this lizard at the entrance to an abandoned Giant Gerbil Rhombomys opimus burrow, which the lizards apparently use as cover and shelter from the strong sun and predators. It allowed us a rather close approach and patiently posed for pictures. The second lizard was drawn to my attention by Mike Weedon and Sharon Stiteler, who, with some other birders, found it next to the cabins at the Korgalzhyn State Nature Reserve. The Sand Lizard Lacerta agilis was the most elusive of the lizards featured here and the photographs I got are not great, but I think they give an idea of what the lizard looks like. 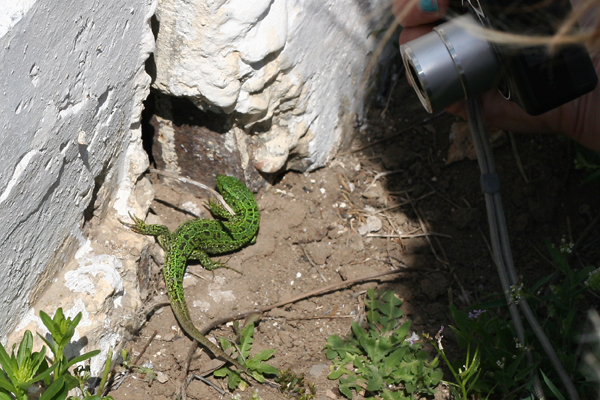 One can find Sand Lizards as far east as Mongolia and across most of Europe; they are even found in England! The one depicted below is most likely of the easternmost subspecies, L. agilis exigua, the males of which can be green even outside the breeding season. Lizard number three was found, like the Steppe Agama, out in the drier eastern portion of the country (it flushed from under a bush when we were trying to get looks at a Desert Warbler) and was identified to the genus Phrynocephalus, otherwise known as the toad-headed agamas, by Nick Sly of Biological Ramblings, whom I can’t thank enough for his help on this post. Once Nick figured out the genus and let me know that the list he had found of the lizards of Kazakhstan included five lizards from that genus I tried to narrow it down to species. This is not an easy thing to do when one has really no idea what one is talking about when it comes to lizards, especially considering that there are some wildly divergent-looking pictures labeled with the same species name when one searches online, but I’m pretty sure that the lizard is a Sunwatcher Toadhead Agama. 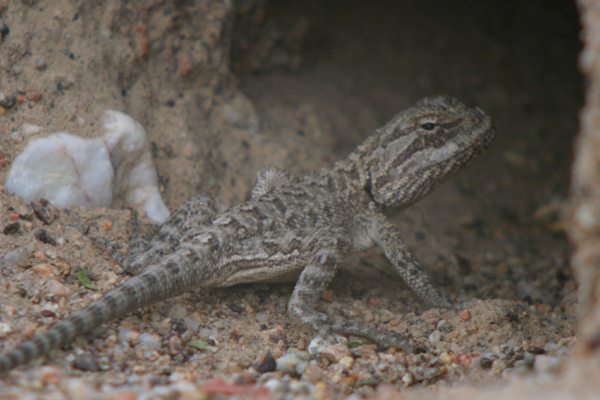 Phrynocephalus helioscopus. 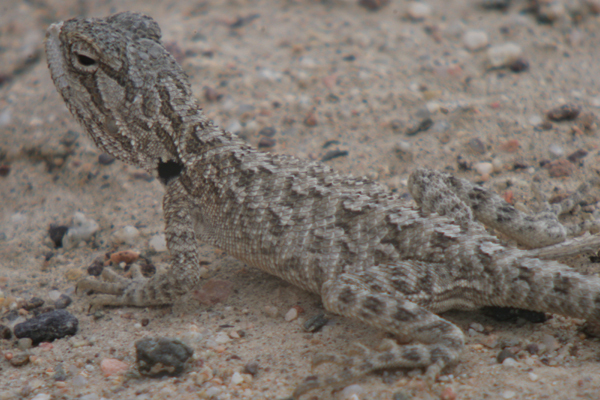 To be safe though, I’ll just label the picture Phrynocephalus sp. The final lizard of this post is a gecko, and one that has a rather funny story attached to how it was found. I had just noticed a tick crawling up my pant leg so I brushed it off and mentioned how much I hated ticks. Another birder came over and wanted to see the tick, which I had watched crawl under a dried up cow patty, so I tipped the patty over and couldn’t figure out why this other birder was so excited to see the tick. Then I realized that he was actually exclaiming over a very-well-camouflaged gecko! Anyway, Nick had to help me with this identification as well, and he is pretty sure it is a Crossobamon eversmanni, which, apparently, is sometimes called the Comb-toed Gecko, though I didn’t try to groom my hair with it. It is one of only two species in the genus and seeing as C. orientalis doesn’t occur in Kazakhstan as far as Nick or I can figure out, it must be C. eversmanni. In the last of the three pictures of the gecko it is licking its own eye, the only way it has to keep its eyes moist in the arid climate. I hope you enjoyed this brief primer on some of the lizards of Kazakhstan as much as I enjoyed seeing them, and considerably more than I enjoyed figuring out what to call them. All errors in this post are mine (though I told Nick, without whom I never would have been able to figure out two of these lizards, that I would send any angry herpetologists his way). If anyone has any corrections or clarifications please feel free to leave them in the comments: I fully and freely acknowledge that when it comes to lizards I know virtually nothing and most likely have gotten some things wrong. 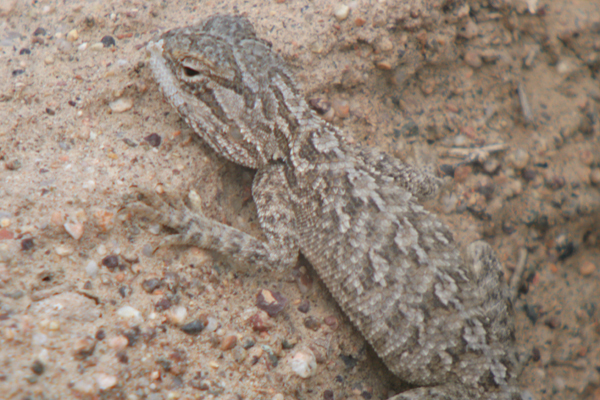 The Steppe Agama reminds me a lot in form and coloration of the Fence Lizards I used to try to catch when I was a kid. Great lizards, impressed by your research. We’ve come to expect that a web site will be there for anything and everything, and it so ain’t true! <3 the lizards! They're adorable!